We are excited to be able to showcase our new BrightPay Cloud product at Accountex 2017!!! BrightPay have just launched an innovative online tool for payroll bureaus, employers and employees. 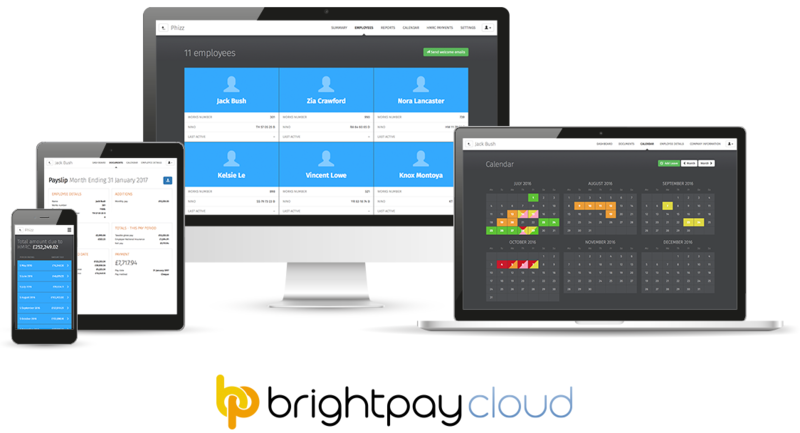 BrightPay Cloud is an add-on to BrightPay Payroll bringing exciting new online features to our customers. BrightPay cloud is not a ‘cloud version’ of the desktop version of BrightPay. Rather, BrightPay Cloud provides a way to connect your payroll data to the cloud to enable new features. Processing your payroll will still be managed and maintained on your BrightPay Payroll which will remain a desktop based solution. We recognise that employers and their employees want a certain level of cloud functionality to access their payroll information on the go, online and at anytime. Until now, BrightPay customers had to manually back up their payroll data. Even if your data is regularly backed up onto your computer, you could lose it all if your computer is broken, lost or stolen. Manually backing up succumbs to human error along the way too. Using BrightPay Cloud, your payroll data will be automatically backed up every 15 minutes to a secure cloud facility. Any changes you make to your payroll data in BrightPay will automatically be synced back to the Cloud. Bureaus can view each client's payroll information on one online dashboard including the employer's paye reference code, payroll reports, employer annual leave calendar, when the last payroll has been finalised to and more. Payroll bureaus can invite their clients to their own personal self service employer portal. Likewise employers can also invite their accountant to BrightPay Cloud. Bureaus can also view the schedule of HMRC payments, any outstanding payments due and access the P30 for each tax period. The bureau dashboard allows you to save time, reduce admin and collect your clients payroll information as you need it. Employers can access their own self service dashboard online where they can view their employees information, manage holiday leave requests, access payroll reports and view scheduled HMRC payments and liabilities. Employers can also grant their employees access to an interactive, online self service portal. Employees can log on and view their payslips and other relevant payroll documents such as P60’s. Employees can even request annual leave from the self service portal. A notification will then be visible on the employer's dashboard and also emailed to them informing them of any employee request. Accountants or payroll bureaus may wish to brand BrightPay Cloud with their own logo. Not only does the Cloud allows accountants to add value to their existing payroll services but also helps position their company branding with their clients. Employers will additionally have the feature to brand their self service portal with their branding. For more info click - BrightPay Cloud Features or BrightPay Cloud Overview. BrightPay will be back again at Accountex 2017. With over 6,500 visitors through the door, Accountex is the place to be to meet the very best of accountants, suppliers and key influencers in the accounting space. For BrightPay, it is the perfect platform to introduce our latest Cloud product to the accounting industry. Drop by our stand and say hello. Our team would be happy to take you through the benefits and features of BrightPay Cloud.